Bathroom Remodeling in Livonia, Novi, Farmington, Farmington Hills, West Bloomfield, Walled Lake, and Metro Detroit. DreamMaker wants to “wow” you every time you walk into your remodeled bathroom! A spacious and luxurious shower, soaking tub, custom-designed tile work, a beautiful sink and vanity, distinctive fixtures, new cabinetry, plentiful storage, layered lighting and heated floors are all possible components in your new bathroom. The bathroom is a sanctuary in your home – a space for privacy, primping and even relaxation. Remodeling this space, be it a master bath, hallway bathroom, or powder room, increases your home’s value and is also an investment in your comfort. 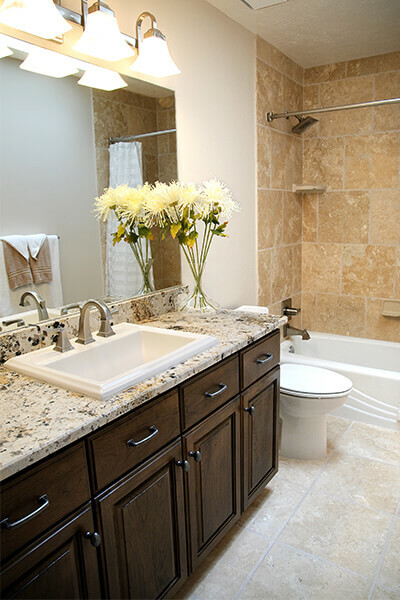 Let us help you plan, design and create the perfect bathroom for your lifestyle that fits within your budget. 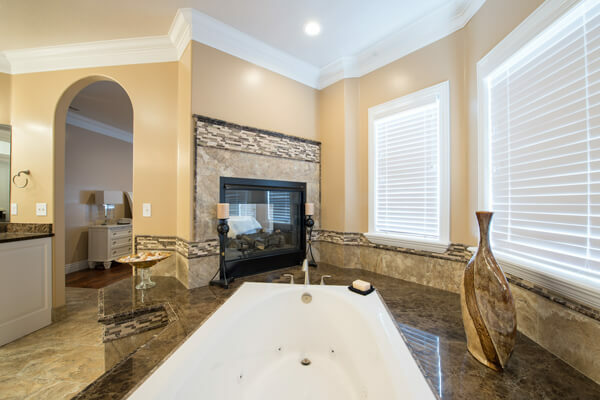 DreamMaker Bath & Kitchen of Livonia can provide you with everything you need to turn your bathroom into the spa of your dreams! Visit our extensive bathroom portfolio for photos taken from actual projects. For additional ideas, come to our Design Center in Livonia where if you’d like, one of our designers can walk you through the bathroom showcase and answer questions. Our franchise experts will provide you with everything from start to finish when updating your bathroom. They offer everything from the initial consultation to the minor details while planning the complete remodel of your in-house getaway. A DreamMaker designer will gladly meet with you at your convenience to discuss the many possibilities for your bathroom remodel. Full-service remodeling – By handling all aspects of the design and the remodeling, DreamMaker can ensure consistency and efficiency throughout all stages of the process. Personalized care – While planning the remodel, DreamMaker will work closely with you to help you select the products that will best reflect your vision for your home in Livonia. Once the remodeling work has begun, your dedicated project manager will keep you up-to-date on the project’s progress every step of the way. Creative design ideas – If you want some inspiration for your bathroom, you can find it at DreamMaker. Backed by remarkable creativity and experience, DreamMaker designers can devise interesting ways to incorporate stylish features, overcome space limitations and accomplish virtually any other goals you have for the space. Will your new bathroom exceed your expectations as a beautiful and functional space? It had better! Choosing the right company to remodel a room in your home is a decision you must make carefully and thoughtfully. Unlike buying a car, you cannot test drive a set of blueprints and renderings. We invite you to ask questions, research us online and schedule a free in-person consultation. You should feel confident in the lasting quality of our work and comfortable with the working relationship we will share while designing and building you the most gorgeous bathroom in the neighborhood! Allow a DreamMaker team member to help you transform your current bathroom into your ideal private getaway. Shower, bath or both? Do you want an enlarged shower with spa-like options? Will you sacrifice your tub for a larger shower or can your space fit both a shower and tub? Would a tub/shower combo make the most sense or will a tub inhibit mobility? How much storage will you use? Do you have a nearby linen closet or do you rely on your bathroom for storing towels, toiletries, medication, makeup and cleaning supplies? We are proud to serve homeowners in Livonia, Novi, Farmington, Farmington Hills, West Bloomfield, Walled Lake, and Metro Detroit. Come visit us in our design center or give us a call today regarding your bathroom remodel.